They are pushing further and further, routing through the scarred and desperate areas, their borders swelling like the scare of some empyrean sickness you see spreading on a world map. But instead of the Plague, it’s the world’s wealthiest and most well-equipped militant group, the Islamic State of Iraq and Syria, or ISIS, a separated division of Al Qaeda. It’s like the angry kid growing up, he’s just a little more sophisticated and a little more angry this time. Their caches of weapons and U.S. antipathy are already substantial, already tromping through police stations and security posts, taking possession of more and more stockpiles of weaponry. Predominately Sunni Arab militants, ISIS “has already seized large swaths of northern and western Iraq, including Mosul, Iraq’s second-most populous city,” reports the Los Angeles Times, also “reportedly snatched the equivalent of close to $500 million in cash from a Mosul bank … “its riches easily eclipse those of Al Qaeda under Osama bin Laden.” They have taken hold of weapons stores from multiple Iraqi army divisions, collecting munitions enough for some 200,000 soldiers. Arming the opponent of the current threat to the United States is nothing new. Facing an unforeseeable future war with U.S. trained, equipped, and financed militants is also something of a favorite pastime for the U.S. government. Most famously since World War II, the United States has trained, equipped, and financed the opponents of their current opponents, only later to fight against their former perversions of allies. In World War II, the United States befriended the communists to fight the fascists. In the Cold War, they took the fascists under their wing in order to fight the communists. As Soviet and British forces occupied Iran, taking it as their own oil state, the U.S. used Iran’s airports and roads to transport around $18 billion worth of military aid to Stalin. But then there was the Cold War. Quite literally, the CIA enlisted former Nazis as their own. Mikola Lebed, for example, led a Ukrainian “terrorist organization” (as described by the CIA itself), was later recruited by the Agency and described as “rendering valuable assistance to this Agency in Europe.” During the Korean War, the CIA dropped guns and ammunition into Burma, arming general Li Mi and his band of nationalists, pointing them to fight Mao’s advancements. They did not advance. Twenty years later, the CIA ignited another war in Burma to kill off the heroin labs and the global drug empire Li Mi and his men created. In 1953 the U.S. attacked the same Guatemalan army forces they originally trained to topple Guatemalan President Jacobo Arbenz. In 1959, several officers of the intelligence agency described Fidel Castro as an ally, offering that he deserved U.S. guns and money. The U.S. poured billions of dollars worth of arms into Afghanistan, into the hands of Islamic guerrilla warriors, in order to fight off the Soviets. Hence, the Taliban. Hence, Al Qaeda. A seemingly endless war on terror is in effect. And too often it’s armed on both sides with U.S.-made weapons. In 2010, the ATF allowed guns from the U.S. to pass freely into the hands of gun smugglers so they could be traced to the Mexican drugs cartels. The operation was named Fast and Furious. They lost track of the guns, hundreds of them, one of which was later used in the fatal shooting of Border Patrol Agent Brian Terry. Since late 2013, and perhaps even earlier, the U.S. has been sending weapons to Syrian rebels, many of which are falling into the hands of Jabhat al-Nusra, another Islamic terrorist organization, as described by the United States itself. $500 million to train the “moderate Syrian opposition.” Modesty to save the Middle East. Because the moderate opposition—armed with glistening caches of western weapons and a stipend of half a billion dollars—won’t turn their backs later. Western thought has always loved its modesty. Modesty to rule them all. Modesty—that is, armed-and-heavily-trained-and-financed-modesty—has always loved its promise of furthering war. It’s a symptom of western thought. Aristotle’s Eudemian Ethics argues that the moral good always lies between two extremes, that moderation is a virtue of the great. No one less than Alexander the Great turned to Aristotle’s philosophy as his own, looking to modesty as a virtue of his own, later slaughtering hundreds of thousands who were apparently not modest enough. Nothing has improved since Alexander. The West has just outsourced its imperial construct with a little more tormented hilarity than it has before. A modest opposition doesn’t exist here. There was nothing modest about the Afghani rebels who fought back the Red Army. We know that now. And today there is nothing modest about Jabhat al-Nusra, who affirms its allegiance to Al-Qaeda, who has orchestrated various car-bombs, suicide attacks, assault of military bases, assassinations of political figures, who fighters have been filmed eating human hearts. The weapons will invariably end up in the hands of the enemy. It’s never done otherwise. These momentary allies, poised like gurgling perversions of chanting friends, don’t likely believe in a coming American Dawn. Because it’s just another violent tragic dawn. If Aristotle wrote a book on ethics, and Alexander drew pictures of swords and horses in its margins, then the U.S. government wrote the treatise on peace and said more guns could achieve it. According to the New York Times, the United States tripled their weapons sales in 2011, primarily driven by the Persian Gulf allies and their concern of Iranian ambitions. 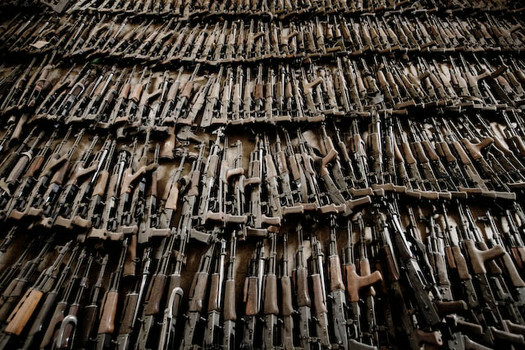 The United States sold $66.3 billion worth of weapons oversees in 2011, more than three-quarters of the global arms sold. It’s impossible to account for those weapons. Fast and Furious was supposed to be a controlled operation, and it lost control, losing track of its weapons. It’s impossible to know how many of those $66.3 billion worth of weapons ended up in the hands of the enemy. And it’s impossible to know who the ally really is. Because the ally has before so often turned towards the enemy. Alexander never satisfied his diabolical lust for modesty—there was not enough world for the world’s most modest. And no republic has ever lived more than three hundred years—and the United States is now two-hundred and thirty-eight, and is giving weapons to angry men in the desert. So another sort of plague spreads across the ancient dusty frontier, and America celebrates another birthday.